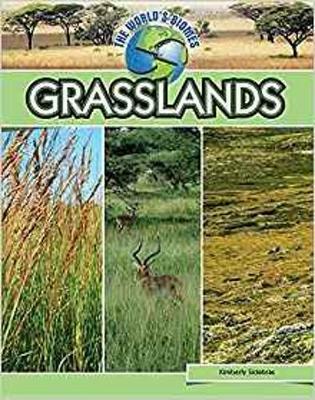 Grasslands are lands dominated by grasses, rather than large shrubs or trees. There are two main types of grasslands-tropical and temperate. Grasslands are the most widespread biome on land, covering one-fifth of the land surface. Directly or indirectly, grasses provide a very la... read full description below. 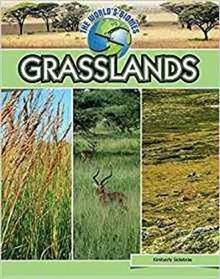 Grasslands are lands dominated by grasses, rather than large shrubs or trees. There are two main types of grasslands-tropical and temperate. Grasslands are the most widespread biome on land, covering one-fifth of the land surface. Directly or indirectly, grasses provide a very large proportion of human food-either through cultivated cereal grains such as wheat or oats, or by providing food for both wild and domestic animals that are eaten, such as deer or cattle. THE WORLD'S BIOMES series provides information on five of the most important large ecological systems in the world today: deserts, grasslands, oceans, rainforests, and wetlands. Each book in the series describes the climate, geology, vegetation, and animal life found in a particular biome, as well as the modern threats and what people can do about them. Each title in this series includes color photos throughout, and back matter including: an index and further reading lists for books and internet resources. Key Icons appear throughout the books in this series in an effort to encourage library readers to build knowledge, gain awareness, explore possibilities and expand their viewpoints through our content rich non-fiction books. Key Icons in this series are as follows: Words to Understand are shown at the front of each chapter with definitions. These words are set in boldfaced type in that chapter, so that readers are able to reference back to the definitions--building their vocabulary and enhancing their reading comprehension. Sidebars are highlighted graphics with content rich material within that allows readers to build knowledge and broaden their perspectives by weaving together additional information to provide realistic and holistic perspectives. Educational Videos are offered in chapters through the use of a QR code, that, when scanned, takes the student to an online video showing a moment in sports' history, a speech, or an instructional video. This gives the readers additional content to supplement the text. Text-Dependent Questions are placed at the end of each chapter. They challenge the reader's comprehension of the chapter they have just read, while sending the reader back to the text for more careful attention to the evidence presented there. Research Projects are provided at the end of each chapter as well and provide readers with suggestions for projects that encourage deeper research and analysis. And a Series Glossary of Key Terms is included in the back matter containing terminology used throughout the series. Words found here broaden the reader's knowledge and understanding of terms used in this field.